We know we have an uphill battle ahead of us under the current administration. The board of directors will be working furiously to come up with a plan start to creating new solutions. How? We need to get serious about the root causes of the problems and not be complacent in simply pointing out the problems. We need inclusive decision-making to create actionable plans. Then, we need to make sure the plans are SMART (specific, measurable, achievable, realistic, and timely) enough that anyone in the community who wants to can help. Then we need evaluation and review to make sure the impact and outcomes meet the intentions. AND WE NEED YOUR HELP! PLEASE CONTACT US TO GET INVOLVED. Wildlife killing contests occur all over Wisconsin; unregulated and often sponsored by gunmakers who award high-powered weapons/equipment such as AR-15s to the winners. In the end, rows of dead coyotes are piled up in the parking lots and dumped in ditches once the contest is over. Friends of the Wisconsin Wolf & Wildlife is working to ban killing contests and end hounding in Wisconsin, the Great Lakes region and beyond. View our film, Dogs of War to learn more about the culture behind hound hunting in Wisconsin. If you believe coyote killing contests like this one do not belong in Wisconsin, please consider donating to our cause to end these barbaric practices, writing a letter to the editor, contacting your legislators, passing county resolutions and more to have your voice heard. For assistance on how you can get more involved with ending hounding and killing contests, please do not hesitate to contact us! The Endangered Species Act provides an essential legal safety net to prevent the loss of plant and animal species to extinction. We work to defend, strengthen, and make sure the Endangered Species Act and other core wildlife protection laws are implemented correctly, by holding federal agencies and others accountable for complying with laws protecting rare and endangered species using cooperation, persuasion, and citizen advocacy. We advocate for protecting and restoring the habitats on which endangered species and other wildlife depend for their survival in addition to reducing threats to wildlife that can lead to their endangerment and extinction, such as loss of habitat, contamination of water and egregious hunting policy. We also work to make sure corridors and wildlife connectivity are in place to protect against the effects of climate change. Wildlife management agencies around the country are struggling to find ways to increase and diversify their revenue bases. The Wildlife Conservation Stamp presents the perfect opportunity for non-hunters, non-trappers, “non-consumptive” wildlife watchers and recreationists to help support the DNR while contributing to wildlife conservation in Wisconsin – and by doing so, to add their voices and perspectives to the development of wildlife policies in our state and be included as real stakeholders. We hope this is the first step to not favor just game species, but also biodiversity. We also hope to enable other organizations to sponsor crucial corridor and connectivity areas for our imperiled wildlife and for all users. Lead is a known toxin and is so deleterious to human, wildlife and environmental health that significant sources of lead have already been banned such as gasoline, paint and pencils. The toxic substance is known to cause serious health effects for wildlife and humans alike, including neurological damage, retarded growth and cognitive development, sensory loss, behavioral impacts and death. The use of lead ammunition fishing tackle by sportsmen in Dane County is dispersing lead throughout the environment. There is abundant evidence that wildlife including and not limited to: doves, eagles, geese, ducks, cranes and loons other waterfowl ingest lead shot from spent hunting ammunition and lead tackle. There is documentation that other animals such as raccoons, otters, fox, domestic pets and other scavengers ingest lead bullets / fragments, and lead tackle from wounded and unretrieved prey, fish or discarded animals or entrails. Scientific data shows that lead exposure for eagles, vultures and other scavengers is on the rise, especially during hunting seasons of both deer and upland game birds. Every year, an estimated 10 to 20 million birds and animals, including birds of prey like the bald eagle, die of lead poisoning either by ingesting lead shot or by feeding on lead-contaminated prey. Lead consumption from ammunition and tackle poses a significant threat to wildlife, including a number of endangered, threatened, or declining species of birds. There are concerns about lead exposure from eating venison, fish and other wild game from deer killed with lead bullets. The Wisconsin Department of Health Services (DHS) recommends using ammunition that doesn’t contain lead because this is the simplest and most effective way to prevent this type of lead exposure. Lead fishing tackle and ammo has been banned in some jurisdictions, including New York State, California and Minnesota and all Federal wildlife refuges as result of these threats to humans, birds and other wildlife. Alternatives to lead hunting ammunition are available for most centerfire rifles, muzzleloaders and shotguns, and hunting activities continue successfully, using less toxic materials such as copper, where lead ammunition is not permitted. Since 1991, the USFWS has required all waterfowl hunters to use non-lead shot, demonstrating that non-lead ammunition and tackle is just as suitable for hunting as lead and it is increasingly affordable, economical and widely available. Studies indicate that lead restrictions have been successful in reducing lead levels in children, birds and other wildlife. The Wildlife Society, The Center for Disease Control, the National Institute of Health, Wisconsin Wildcare, USGS National Wildlife Health Center, Humane Society of the United States, Friends of the WI Wolf and Wildlife, The Audubon Society, The Raptor Center, former Fish and Wildlife Director Dan Ashe and former President Obama support the replacement of lead-based ammunition and tackle with non-toxic products. These regulations do not require use of non-lead ammunition when target shooting or for personal protection. Educational and voluntary efforts by the WI DNR to reduce the use of lead ammunition in Wisconsin fail to significantly lessen the impacts of these materials on humans and wildlife health. There is currently a threat in Congress, to gut the entire Endangered Species Act and Environmental Protection Agency, so we are calling on Dane County to address the issue of the dangers of lead ammunition and tackle to both humans and to wildlife, including birds. Today’s Great Lakes parks, forests and other protected areas, although critical to conservation, are too small and isolated from one another to support wildlife migrations and dispersals, native plant communities, and services provided by nature—like pollination, carbon storage and clean water. 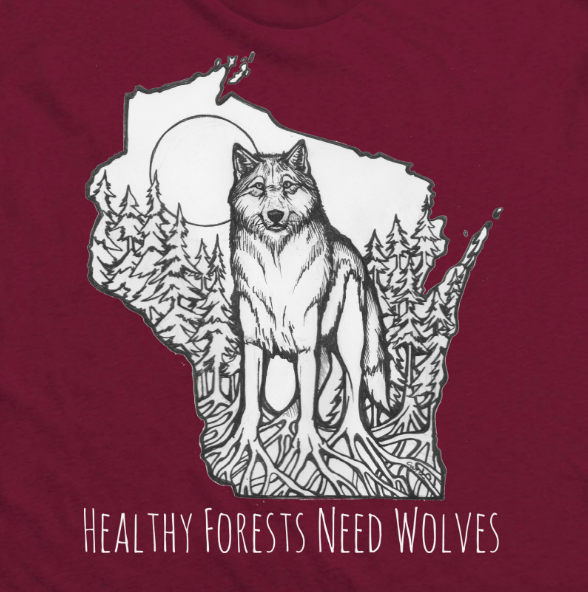 Friends of The Wisconsin Wolf & Wildlife is helping advocate protecting core reserves, reconnecting them via vast corridors of habitat, and advocating for predators. Many adults in the United States have had a personal connection with nature at some point in their lives. They caught frogs, chased butterflies, listened to birds, and picked flowers. These special moments in nature, however, are not as available to our children, because many iconic and once-common birds, fish, plants, and wildlife are in decline. It is part of a much larger problem—that of global biodiversity loss. Today scientists agree that we are facing the sixth great wave of extinction. Yet this wildlife and human tragedy that touches upon every continent and every country has yet to stimulate a sense or urgency in the media and the public. We are working with the Endangered Species Coalition to build a movement in the United States to protect biodiversity and the species most imperil. Our goal is to develop a large base of individuals deeply invested in protecting wildlife who are participating in both online and hands-on engagement for species. We know that Americans worry about our children not spending enough time in nature. We want them to know the other half to the story—nature isn’t what it once was. We need to bring it back to its former self, so that children can experience the true wonder of the outdoors. To build this broad base of support for biodiversity and imperiled wildlife, we launched our Vanishing Campaign: American Species Your Children May Not See. We are highlighting some of the most charismatic mega fauna and micro fauna that people care most deeply about—from the polar bear to the monarch butterfly. The campaign is designed to both grow our base and to deepen the support of our base. It follows a three-prong approach: educate, inspire, and activate. One of the most powerful components of our campaign has been our work to protect monarch butterflies and pollinators. We’re expanding these efforts to create volunteer Pollinator Protectors. This campaign is designed to holistically address the decline of native pollinators in the United States through education, advocacy, and the development of pollinator gardens at locations across the country. The project will educate and engage core constituencies within our communities (e.g., youth, gardeners, beekeepers, organic farmers, faith voices, and our activist base) in the decline of native pollinators. We’ll give them tools to help restore or replace vital habitat for these species. And we’ll empower them to sway decision-makers to take actions to protect pollinators. Today we face a sixth great extinction crisis. Studies consistently show an alarming decline in every taxa. At the same time, our political environment has placed public lands and endangered wildlife in peril. Members of Congress are advocating handing public lands over to the states, eliminating the Antiquities Act, and repealing and replacing the Endangered Species Act. The administration is equally hostile. Secretary of Interior Zinke—with a 3 percent League of Conservation Voters score and a 9 percent National Parks and Action Fund score—revoked the lead ammunition regulations that prevent deaths of California condors on his first day. His special assistant, Kathleen Benedetto, is an Endangered Species Act opponent. There is, however, a great opportunity in the United States to implement one of the best solutions to this crisis—the creation of wildlife corridors, connecting America’s great landscapes. The United States has been a leader in great ideas for nature. We spearheaded the National Park Service. We passed one of the most protective bills to protect species, the Endangered Species Act. Today nature needs us to once again take a visionary step forward in protecting wildlife, and in the end, protecting ourselves. Looking back on its 100-year history, the National Park System has charted a course for the future. The Service intends to set the conservation of biodiversity as a core purpose of park management. And the Service recognizes that preserving biodiversity cannot be limited to park areas. “Parks cannot survive as islands of biodiversity. They need to be linked with other natural areas through wildlife migratory corridors and greenways.” Using these wildlife corridors, wildlife can move from landscape to landscape. This is particularly necessary for keystone species—species that play a disproportionately large role in keeping their ecosystems and other species healthy. And from a political perspective, wildlife corridors are also an. Champions of wildlife protections are looking for something that they can rally around—a proposal that would focus attention on solutions. Furthermore, wildlife corridors are an issue that has shown promise in gaining bipartisan support. For millions of years, species have adapted to each other and the cycles of nature. Climate change introduces chaos into what has previously functioned like a finely tuned orchestra. It disrupts nature’s timing. The life cycles of animals, birds, fish, and plants suddenly do not synch as spring arrives earlier, impacting plant pollination, seed dispersal and food availability. Climate change also causes species to shift further north or upslope. It spreads disease farther. It causes areas to become too wet or too dry. It acidifies oceans. It increases the frequency of wildfires. And, it simply makes the world too hot. Climate change replaces nature’s essential harmony and rhythms with a disastrous cacophony. In recent years, the death toll has risen. Several populations of the Pika appear to have gone extinct. Approximately 4,000 young walruses were trampled to death because, with less sea ice available to them, they were forced to mass on land. More than 200 whales and dolphins beached themselves in Tasmania likely because changing currents moved food sources closer to shore. Gray whales with bony shoulder blades and protruding ribs starved to death as food supplies crashed. Hundreds of Magellanic penguins died on the shores of Brazil, probably in search of food that is no longer where it used to be. Hundreds of puffins starved to death in the North Sea as their food disappeared. Ancient forest trees—pines, firs, and hemlocks—across the West have died. And so the catastrophes have begun. Scientists are calculating how much we’ll lose. According to the Intergovernmental Panel on Climate Change (IPCC), 20 to 30 percent of species will be at an increased risk of extinction if global temperature rises above 1.5 to 2.5° C. A recent study published in Science—a meta-analysis of 130 previous studies—put that number at one in six species if climate changes proceed as expected. Driving this many species to extinction will result in a planet that has lost its beautiful diversity and many of the benefits that nature provides to people. That is the scenario we face today. Climate change has arrived. No longer a black cloud in the distance, it is here right now. It is a fireball melting our titanic glaciers, drying our mighty rivers and setting our deserts ablaze. As we work to prevent or slow climate change, we now have no choice but to also prioritize climate adaptation. Goal: Protect habitat to advance adaptation and connectivity for vulnerable species in key regions. Climate adaptation relies on healthy ecosystems. Scientists are uncovering that in order for ecosystems to be fully functioning, they need umbrella species to be present in large enough numbers to fulfill their ecological role. Unfortunately, many of our country’s most important umbrella species—wolves, lynx, wolverines, etc—are endangered wildlife. Umbrella species, by their nature, have wide ranges. To ensure their success, they need connected habitats. They need corridors. Protecting wildlife at the ecosystem level has become increasingly recognized as the most effective approach. Yet, while landscape-level conservation has become part of the public lexicon, imperiled species have not received the attention they need in this conversation. The survival of these species—at the level at which they fulfill their ecological role—is absolutely crucial for fully functioning ecosystems. Protecting climate corridors for vulnerable umbrella species creates a positive feedback loop. Climate corridors protect umbrella species. Umbrella species make ecosystems healthier. And healthy ecosystems are better buffers of climate change. Done well, climate adaptation is one tool in the toolbox to mitigate the worst impacts of climate change. We have agreed to provide two GPS wolf collars for the Red Cliff Nation in conjunction with a matching grant from the Bureau of Indian Affairs and USFWS. This will provide real time information on wolf travel on the Bayfield Peninsula in Wisconsin so that conflict can be avoided and wolves can have sanctuary. This is part of our ongoing dedication to non-lethal wildlife coexistence. We are working on a project to restructure the Defender’s of Wildlife Non-Lethal booklet in conjunction with other experts, to tailor it to the needs of all wildlife, especially large predators for the Western Great Lakes on behalf of Friends of The Wisconsin Wolf & Wildlife and Endangered Species Coalition. We have met with Wildlife Services and Wisconsin Department of Natural Resources and are reaching out to other partners who could be involved with this project to save lives, both farm animals and wildlife. Non-lethal can be expensive, period and just getting the information out to farmers who have experienced depredation issues and to wildlife services will be cost funds for printing. We are also creating a network of farmers currently using non-lethal forms of coexistence that might be willing to act as mentors to create community project around reservations and rural communities.Right now, farmers are not able to kill wolves, even those in the rare instance that attack livestock or dogs. We want to empower farmers without having them resort to unlawful conduct and to see the benefits of living with predators.